Some say the Russell 1000 is the best representation of the U.S. stock market. What is the Russell 1000? If you follow the news, every day you'll hear newscasters refer to the Dow Jones Industrial Average (DJINDICES:^DJI), the S&P 500 (SNPINDEX:^GSPC), and the Nasdaq Composite (NASDAQINDEX:^IXIC), three of the most important indexes that measure, if not the health of the American stock market, then at least investors' confidence in it. 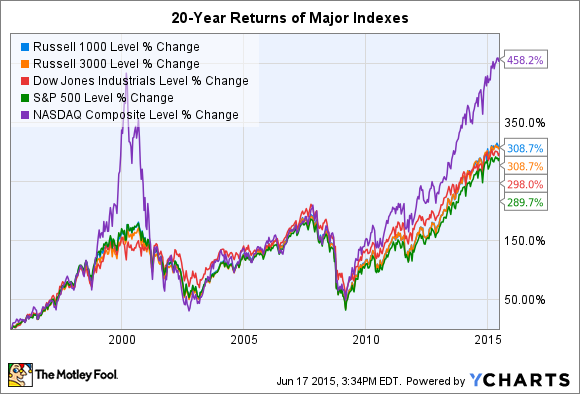 However, the Russell 1000 is at least as important as its three better-known index peers, and maybe a little more so. Let's talk about why. A stock market index is a list of publicly traded companies. Indexes track the performance of different groups of stocks. They may contain certain stocks based on their industry, their growth potential, their dividend history, the size of the underlying company, or a combination of factors. An index can encompass a small number of stocks (like the Dow, with only 30 components) or a large number of stocks (like the Nasdaq Composite, with more than 3,000 components). And there are a lot of indexes out there; the categories above barely scratch the surface. Indexes also have varying ways of deciding the "weighting" of each component -- i.e., the amount of influence each stock has on the overall index. Most commonly, a company's market capitalization will determine how much of the index's overall value is ascribed to it; the greater its market cap, the more impact its share price movements have on the index. Other indexes are "equal weight," meaning every company's share price moves affects the index equally, no matter how high (or low) the company's market value. The Russell 1000 is a list of the 1,000 largest U.S. public companies. It's a subset of the Russell 3000, which lists the largest 3,000. The companies in the Russell 3000 represent about 98% of the U.S. stock market value, making it perhaps the most accurate representation of domestic stock performance. The Russell 1000, while containing only one-third as many stocks as the Russell 3000, still represents some 92% of the U.S. stock market value. Russell Investments, which created and maintains the Russell indexes, reranks every public company in the U.S. at the end of May each year. If a company is deleted from any Russell index during the year (which can happen if it merges or is acquired, is taken private, or goes out of business), it won't be replaced until the annual "reconstitution" period. The same goes when companies that "grow" into the Russell 1000 are added. Even big IPOs (think Twitter or Facebook in recent years) won't become part of the Russell 1000 until the next reconstitution after they go public. You can invest in most major indexes using index funds, which are mutual funds or exchange-traded funds that invest in the stocks that make up an index. This sort of passive approach to investing won't lead to market-beating returns, as you'll get roughly the same performance as the index. In fact, your returns will be just slightly lower due to the fees you'll pay to the fund manager. However, index funds, with their passive approach and broad diversification, take a lot of the work and risk out of stock market investing. 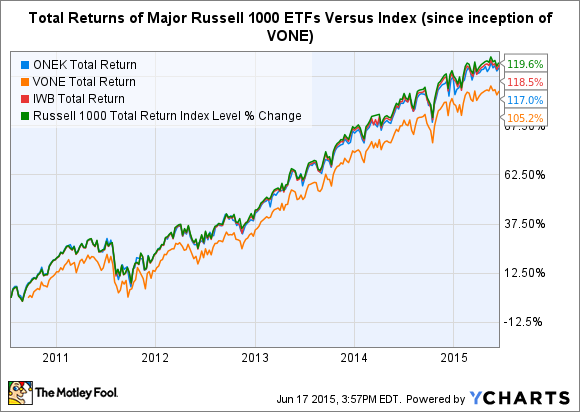 While Russell doesn't directly offer a mutual fund or ETF for any of its indexes, a number of index funds track the Russell 1000, including the Vanguard Russell 1000 ETF (NASDAQ:VONE), the iShares Russell 1000 (NYSEMKT:IWB) ETF, and the SPDR Russell 1000 ETF (NYSEMKT:ONEK). The expense ratio -- which measures a fund's annual management fees as a percentage of assets -- for the SPDR fund is currently 0.11% per year, while Vanguard charges 0.12% for retail investors and iShares charges 0.15%. Relatively speaking, these fees are very low, but over time they can add up. Even the tiny difference between the 0.15% iShares charges versus the 0.12% Vanguard charges would eat away almost $2,000 in returns on a $10,000 investment over 30 years. That's 20% of your initial investment lost due to a difference in annual fees of three hundredths of 1%. Though the SPDR ETF has the lowest expense ratio today, Vanguard seems most likely to keep its fee structure lowest over the long term due to the way Vanguard is structured. iShares and SPDR are backed by companies with shareholders and owners, who expect a profit on their investment, while Vanguard is owned by its fund investors. Needless to say, this creates higher incentive for Vanguard to drive costs as low as possible, while the others might try to squeeze out an extra few hundredths of a percent in fees each year. Because higher fees don't increase index funds' returns, going with the low-cost leader (historically Vanguard) is generally the best bet. 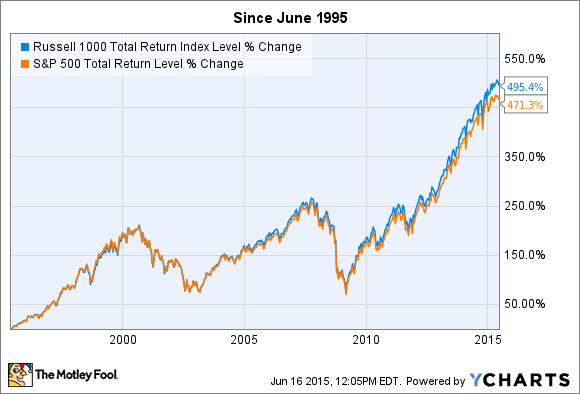 Should you invest in the Russell 1000? As the popular disclaimer states, past performance is no guarantee of future returns. Yet there is some evidence that the Russell 1000's broader base of smaller companies (which often have greater growth prospects) is a factor in its long-term outperformance over the S&P 500. Based on its historical performance, the multiple cheap index funds available, and the likelihood of future strong performance, I'd say the Russell 1000 is every bit as relevant as the S&P 500 -- and a cheap Russell 1000 index fund is a smart long-term holding.